Most of you humans out there (should) know that you get books from a library, right? Well. Have you ever wondered where the library gets its books? My library gets a whole lot of books from Baker & Taylor. They are a big-time book and entertainment distributor and they are very good at getting us books and movies and things super-fast. They also have two cats as mascots. 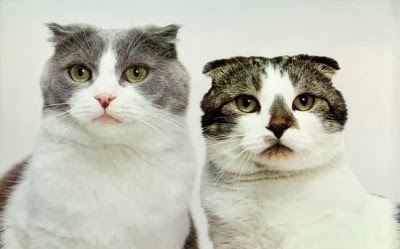 Baker and Taylor were Scottish fold cats who worked at the Douglas County Public Library before becoming international superstar mascots in 1988. 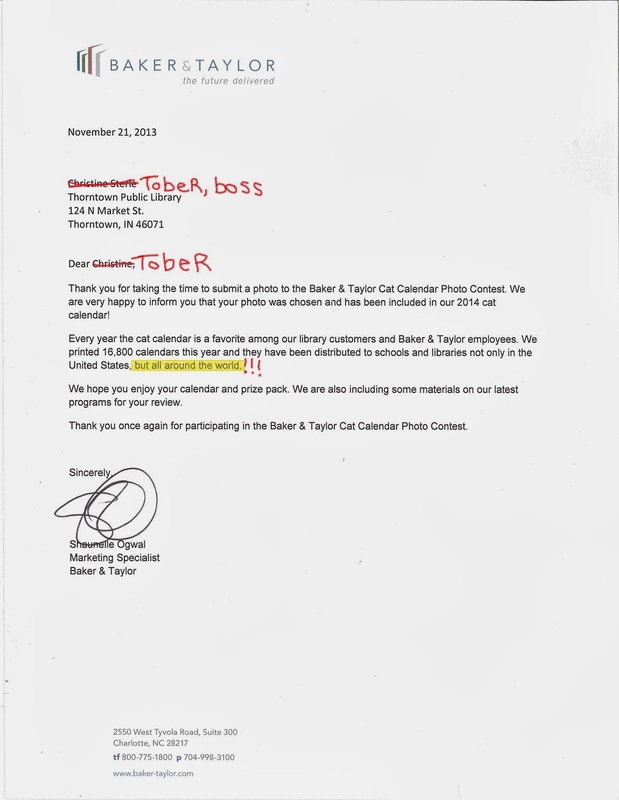 Their images continue to appear on Baker & Taylor marketing materials, and they are usually featured on Baker & Taylor's calendar. This year B&T had a special Cat Calendar Contest in June. Thankfully, June was back before AB Christine became a lazy bum, and she managed to take a whole 20 minutes out of her "busy" day to enter me in the contest. I was really excited to hear that I would be included in the 2014 Cat Calendar! I am gazing into your soul. Guys. I am on the front of 16,800 calendars! All over the world, excited librarians are opening their eagerly-anticipated B&T calendars and seeing my gorgeous eyes and magnificent whiskers. Probably fainting, too. 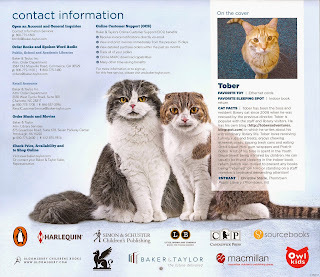 It's a good time to be a librarian--and a great time to be a Library Cover-Cat! I'm on the BACK cover, too! Our library's B&T sales consultant, Joan, made a special trip to the library to see me and take pictures and leave a few extra calendars for my staff. (I thought there might be a scuffle over the couple that came in the mail.) Joan was really happy because TWO Indiana cats made it into the calendar. Uma (Miss August) was entered into the contest by Becca from Bloomfield-Eastern Greene County Public Library! 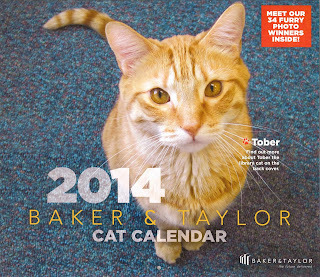 There are lots of nice-looking cats in the Baker & Taylor calendar, and I am honored to be the one chosen for the cover. It's obviously my whiskers. They are pretty great whiskers. Or my eyes. Pools of molten gold. Okay, I'd better wrap this up. AB Christine is getting fussy and muttering something about a Big Head. My head is perfectly proportionate, thank-you-very-much. Maybe that's why I'm on the Cover. Note: This is a late post. AB Traitor Christine was having "rotation issues" with her phone. That's what she gets for putting me through all of what you'll read below. 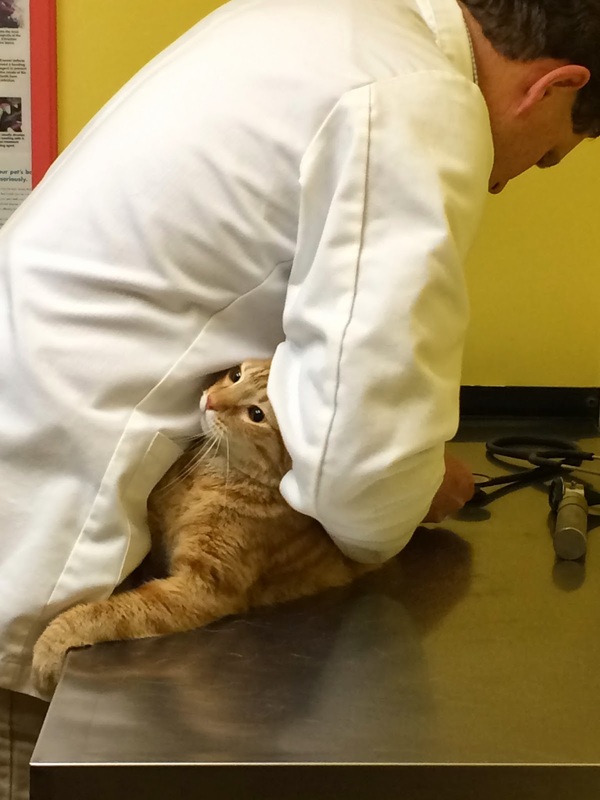 Well, I went to the V-E-T today for my Annual Rear-end Stabbing. I almost got lucky. AAB Karen took a day off and left AB Christine in charge of taking me in, which was not a very smart thing to do. AB Christine was all "La-de-dah, Tober's appointment is on Tuesday, La-de-dah, typity-type" and had no clue that I was supposed to be somewhere at 2:20pm. It's extra funny because AAB Karen emailed her from HOME to remind her and she was all, "I got this" and still she forgot. 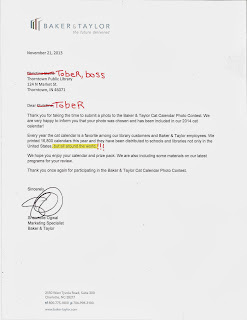 So we got a call from the V-E-T office (they don't want to miss a chance to torment a cat) saying "Hey where is Tober?" and my posse rounded me up and away we went. AB Christine drove (!) and AAB Britta hugged me. So we got there thirty minutes late and I got weighed and Britta and Christine told the technician how awesome I am. I don't have any lumps or bumps and I eat Good Life and I use the box and I most certainly do NOT scoot because gentleman-cats do not do such things. Then the technician said she had to ask extra questions this time around because I am--you won't believe this, guys--a "senior" cat. There's something off about that, though. I looked up this nifty Cat-to-Human age chart. 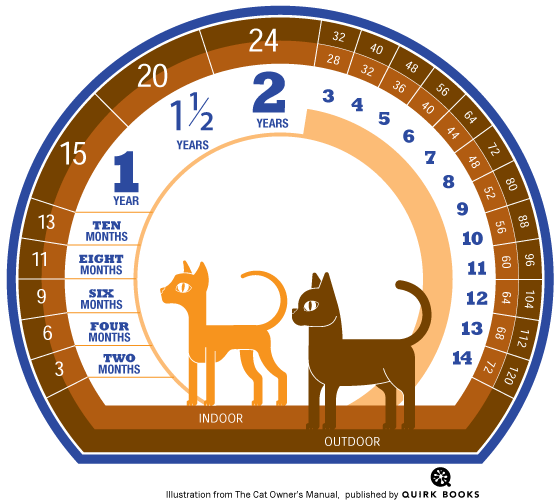 According to this chart and due to my Indoor-onlyness, I am forty-four (44) in Human years. Here is your assignment, blog readers: Go find a 44-year-old Human and offer her a Senior Discount. Let me know what happens. Anyhoo, I do not feel like a senior cat. I am in my prime! And it's how I feel that matters, right? Then Dr. Jon examined me (which is very rude) and stabbed me in the rear-end while Christine laughed and took pictures and Britta felt sorry for me. Feline equivalent of an AARP mailing. Oh, and don't forget the HOT PINK feline training device! It's in Christine's drawer right now, but it was kind of fun seeing how well she's trained. She throws it across the library, and I stare at her until she goes to pick it up. So maybe I should call it a Human Training Device! My library ladies say I should be Thankful that I have such a fantastic V-E-T office staff and I suppose they are right. THANKS Dr. Jon and Thorntown Veterinary Clinic staff! I was only sore for one (1) whole day. They're definitely a great place to take your pets to be tortured treated. My next post is going to be super-awesome! Something special arrived in the mail today!